How should International Medical Graduates prepare for the US residency match? What would be the best path to ensure success? International Medical Graduates making the decision to pursue postgraduate medical education training in the US are on a rewarding path, but not a simple one. The process is not only academically competitive, it also requires financial investments. The average img residency applicant will invest two years or longer to take the US examinations known as the USMLE and to develop their ERAS application. Prior to beginning your pursuit of an img residency, it is imperative you have a solid understanding of the overall process. Applicants know the higher the USMLE score the better but they are often challenged by how to prepare, what materials to utilize and what the score itself correlates to. Countless times we have heard “I knew I had to become ECFMG certified but I didn’t have any guidance so I simply took the exam and passed it.” While passing the exams and becoming ECFMG certified are strong achievements, how does this correlate to an applicant’s success? The IMG success rate in the Match is 54.8 percent of US IMGs matched to PGY-1 positions and 52.4 Percent of non US IMGs. This is the highest match rate since 2004, but it still leaves a good portion of applicants unsuccessful. What is it that sets these applicants apart? Focused organization and preparation are the keys to finding a US Residency Match. 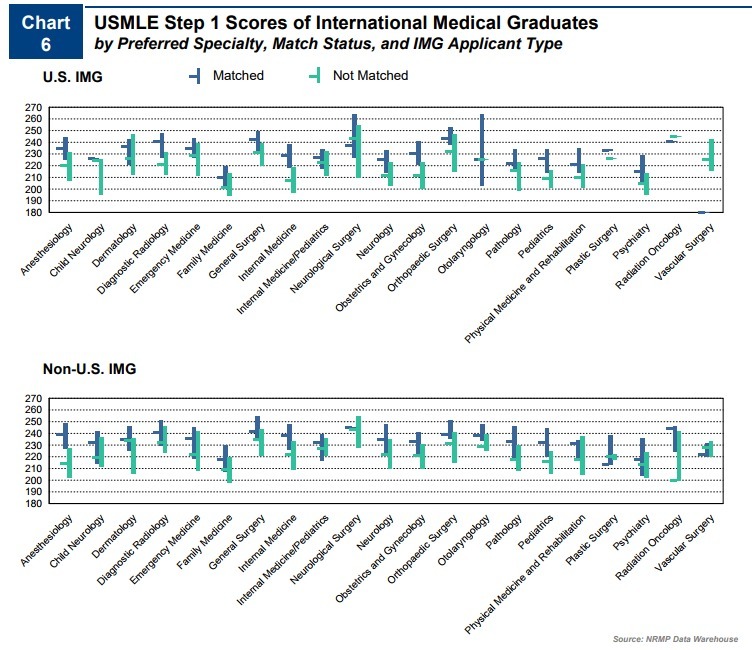 The data below shows data from the 2016 Main Residency Match and score of International Medical Graduates broken down by Specialty, Match status and U.S. and Non-U.S. IMG. An applicant’s performance on USMLE examinations is a good indicator of one’s viability in the residency match but this is only a piece of the greater picture. Your ERAS Application Form serves to highlight your full timeline from graduation to date of application. Coupled with letters of recommendation and a residency personal statement, your application in its entirety serves as a bid for a residency interview. Your application presents a unique picture of who you are; it will determine your level of competitiveness. Your performance on the USMLE exams will better enable you to understand the competitiveness of your application. By understanding your competitiveness, you will be able to tailor your future endeavors, US clinical experience, research, and volunteer activity specifically for specialties where you have a better chance of matching. This will ensure that the letters of recommendation you receive for your performance in your clinical rotations match the specialties for which you will be applying. One of the most vital components of your application will be current US clinical experience. The most important thing you can do to help your residency application at this stage would be to focus on performing well on your USMLE. You may find up to date current information about the exams here http://www.usmle.org. Contact our team at IMGPrep for a free comprehensive consultation to help you understand the process and maximize your chances of a successful residency MATCH. Thank you for your interest in IMGPrep, and we look forward to working with you in the future.